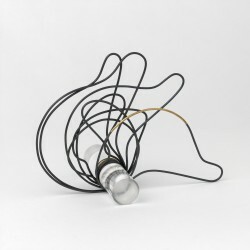 Silver wire necklace, shaped to fit over a drawing of the shape. Silver wire shaped exactly to fit over a drawing of the shapes. 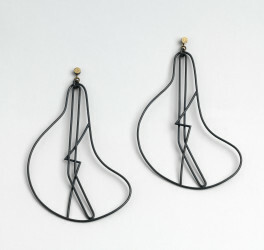 These shapes have then been formed into two necklaces by the use of 18 ct yellow gold links. The silver is oxidised and protected with Renaissance wax. 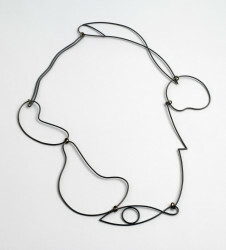 'Overlapp' For 'Big Head': Necklace, Wendy Ramshaw, 1996, Crafts Council Collection: J249. Photo: Todd-White Art Photography. Part of the Picasso's Ladies Collection, a collection of jewellery, the making of which spans 10 years. All jewellery relates to a painting by Picasso. This suite incorporates in addition a set of rings and pair of earrings.